Readers young and old will have the chance to explore the new Central Library and Archives in Halifax, when it opens to the public for the first time at 9.30am on Tuesday 5 September. This is the next stage of the remarkable transformation of Halifax Town Centre, with the new library opening next to the Piece Hall and Square Chapel creating a vibrant cultural, heritage and learning quarter. Visitors will be able to admire the beautifully restored Square Church rose window and enjoy upward views of the tower and spire from the staircase as they tour the building, from the local studies section and the West Yorkshire Archives’ room on the lower ground floor to the adult non-fiction collections on the second floor. Alongside a host of exciting activities to mark the opening a self-guided Heritage Trail has been put together to highlight the preserved historic features. 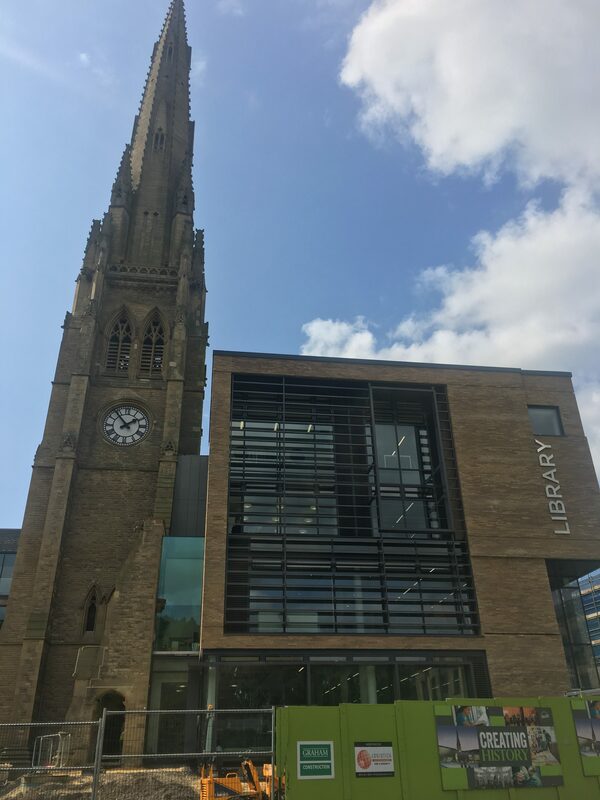 The old Central Library and Archives at Northgate, including the Halifax Visitor Information Centre, will close for the final time at 5.30pm on Tuesday 29 August to allow staff the time to transfer the remaining stock and equipment to the new building and do the final preparations for opening. ‘This is a really exciting moment for Halifax, and Calderdale, following the fantastic opening day for the Piece Hall on Yorkshire Day. Visitors will not fail to be impressed by the new library, which conserves the landmark spire and rose window of the Square Church within a brand new 21st century building with state of the art facilities’. The opening day will be marked with a range of drop in activities for children, families and young people. A family craft session will be held between 10.30am and 12 noon, followed by the first ever Busy Babies session in the new children’s library will take place at 1.30pm. Youngsters can make duct tape crafts and emoji stress balls in the new teen area on the first floor between 1 and 3pm or play with a range of new board games. Friday 8 September is a Local Studies focus day and the autumn events programme will begin on Thursday 14 September. The new Central Library and Archives will be officially opened by Dr Jonathan Foyle, writer and architectural historian in the presence of Calderdale Council’s Mayor, Cllr Ferman Ali, on the afternoon of Saturday 9 September 2017. The new Central Library and Archives has been wholly funded by Calderdale Council. To find out more about the civic opening and the new Central Library and Archives visit our website or follow Calderdale Libraries on Twitter @CMBClibraries.